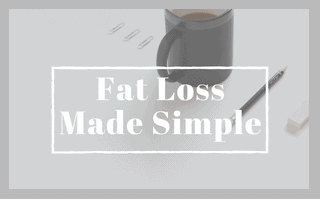 Never has losing weight felt more complicated than in the Internet age when overwhelming amounts of conflicting information are available able at the click of a few buttons. Well-intentioned women everywhere have been overwhelmed into inaction because they can’t figure out what their priorities should be. Calories are energy, specifically units of heat energy that give value to foods. We need energy to sustain life, which means that we need calories to do everything from breathing to walking to digesting. The calories in food just describe the potential energy your body can derive from that food. Calories in food come from 3 places: protein, carbohydrate, and fat. These are known as macronutrients because our bodies need them in large quantities (as opposed to micronutrients like vitamins and minerals that our bodies need in smaller quantities.) All 3 macronutrients play important roles in your body. The issue is that many of us are taking in more calories than our bodies need so the excess ends up getting stored as fat and making us overweight. In order to lose weight, we need to be taking in fewer calories than our bodies need. The Calories In part of the equation is pretty simple: we take in calories from the things we eat and drink. Basal Metabolic Rate (BMR) – This is the total calories your body needs to keep you alive. Typically it’s calculated in a lab, after a 12-hour fast, in a controlled environment, after laying motionless for an extended period of time. It actually contributes a significant number of calories to your total daily expenditure. Thermic Effect of Activity (Exercise) – These are the calories you burn while you’re exercising. In your 1 hour HIIT or CrossFit class, you’re burning several hundred calories, so that contributes to your overall expenditure. Non-Exercise Activity Thermogenesis (NEAT) – These are all the calories you burn doing stuff throughout the day outside of your structured exercise time. Walking to the mailbox, picking up your kids, cleaning the house, tapping your foot, all those movements contribute to your daily NEAT. What To Do: Conduct a 1 week food audit and look for places that you can cut out junk food or liquid calories and increase nutrient-dense food like lean protein and veggies. If you’re a numbers-based person, consider tracking in an app like MyFitnessPal to learn how many calories you’re currently taking in. Protein, found in foods like meat, poultry, and seafood, is always important, but even more so when you’re in a calorie deficit. Lean proteins help build and repair every tissue in your body, including bone, hair, skin, nails, and muscle. Muscle is especially important because when you say they want to lose “weight,” typically you want to lose fat. Taking in sufficient protein will help you retain muscle while losing fat, which, in turn, will give you the lean, fit look that you’re probably shooting for. Additionally, protein plays a role in synthesizing hormones, boosting your immune system, and can increase satiety (how satisfied you feel after you eat) – which is especially important in a calorie deficit since it’ll help you not feel hungry and miserable all the time! What To Do: Aim for .7-1g of protein per pound of bodyweight per day. Just take your weight and shoot for that many grams of protein and if you end up a little bit under, no biggie because you’re still within the range. If you’re not interested in counting calories or tracking macros, shoot for 1-2 palm-sized portions of lean protein, which equates roughly to 25-50g per meal. If you eat fewer meals, shoot for the large portion size and if you eat more frequently, having less at each meal is fine. For a list of lean proteins, download the Body Transformation Guide. Resistance – or strength – training is any exercise that requires your muscles to contract against an external resistance (or force), whether that resistance is from your bodyweight, dumbbells, medicine balls, barbells, tires, etc. Strength training is important for a whole host of reasons, including building a stronger heart, reducing blood pressure and cholesterol, controlling blood sugar, relieving anxiety, and helping manage quality of life for lots of conditions. Specific to weight loss, strength training helps you retain muscle while you’re eating in a calorie deficit. Remember, ideally you are losing fat and keeping your muscle, so the combination of sufficient protein and regular strength training is important. Another weight loss-specific benefit of strength training is that it can help increase your metabolism, which is the sum of all processes in the body. This is because muscle has higher energy demands than fat. Admittedly, this increase in metabolism is quite small but over time an increase in muscle mass can make a difference. Lastly, after a strength workout, your body continues to need oxygen at a higher rate than normal (this is called Excess Postexercise Oxygen Consumption, or EPOC), which means that your body is burning calories at a higher rate than normal for several hours after. In other words, you get a lot of bang for your buck in a strength training workout. What To Do: Aim for 3 strength training workouts per week and make these your priority. If you’d like to add in a day or two of high-intensity interval training or steady-state cardio, that’s fine, but don’t do so at the expense of your strength training. Not sure what to do for workouts? The Body Transformation Guide has 30-day worth of workouts for you! Healthy weight loss usually occurs at a rate of ~.5-1% of your bodyweight per week. This means if you’re 200 pounds, you may lose 1-2 pounds per week. But here’s something else you should know: weight loss is rarely linear, meaning it’s unlikely you’ll lose 1-2 pounds every week. More likely, it’ll look something like 1 pound the first week, half a pound the second, none in the third, 2 in the fourth, etc. Lots of factors contribute to this but just know that it’s likely and don’t get too bent out of shape when it happens. Given this realistic rate of weight loss, it’s likely that it’s going to take a while to reach your goals. That’s why it’s so important to be patient and consistent. This is not a sprint. You need to commit to this for the long-haul and make lasting changes to your lifestyle if you want to reach your weight loss goals and maintain your new weight once you get there. What To Do: Setting smaller, interim goals to celebrate along the way, and focusing on your actions rather than outcomes can make a big difference in whether you commit to seeing the process through or give up prematurely. And read this: 5 Keys To Being Patient & Consistent with Your Weight Loss. If I can help in any way, please don’t hesitate to reach out!